This garment was first discussed by Dorothy K. Burnham in the early 1970s. For many decades all other references to this garment were based on this discussion. Heather Rose Jones performed her own examination of the garment and published her somewhat different findings in 2001. Both of these interpretations are presented here. It should be noted that, due to the circumstances of the garment's display, neither of these examinations was made under ideal circumstances, so many details are simply unavailable. Burnham herself says that her description was an estimate, since it "was not possible to make a proper examination." It is housed in Notre Dame, Paris. 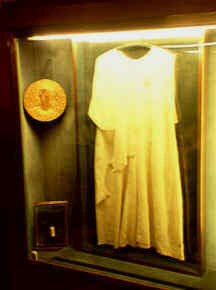 It is a relic attributed to King Louis IX of France (1214-1270), and is said to be the oldest extant undergarment, although neither of the latter assertions is really all that solid (it may not be an undergarment, and the Arras Shirt and the Chelles Shirt, at least, appear to be older). Attached to the shirt is a small parchment label written in a 15th century hand that reads (translated) "This is the shirt of my lord Saint Louis who was king of France and it only has one sleeve." This garment greatly resembles cote designs discussed elsewhere.. It is assumed that it was meant to be worn under a woolen cote. The shirt was made of a tightly woven, fine, white linen. All seams appear to be bound.with very tiny strips of tape. (not bias tape) estimated to be about 2-4 mm wide. At the collar, there appears to be a very fine facing.that extends past the point of the opening. The seam binding of the gores also extends for a short distance beyond the point of the inset. The sleeves and hem appear to have a small rolled hem, also estimated to be about 2-3 mm. The garment is displayed inside out. An noted, the garment is missing one sleeve (the left as displayed, or the right if turned right side out). In a lengthy discussion on the 75years Yahoogroup in late November 2002, Costume historian and DISTAFF founder Robin Netherton reaffirmed and added to Heather Jones' observations of the garment. During this discussion, several photographs came to light, as well as a text from a Guide Book that added to the available information. My interpretation, based on measurements of photographic evidence. Burnham, Dorothy K. Cut My Cote. Toronto: Royal Ontario Museum, 1973, 1997. Jones, Heather Rose. "Another Look at Saint Louis's Shirt" Tournaments Illuminated. Winter 2002, 22-23. Netherton, Robin. email to http://groups.yahoo.com/group/75years 18-22 Nov 2002. "La France de Saint Louis", Paris, 1970, posted by Joris - De Liebaart vzwto http://groups.yahoo.com/group/75years 22 Nov 2002.